When you ship products, they become vulnerable to sudden movements, improper handling and environmental elements. These dangers can result in damaged goods, unplanned labour and costly reverse logistics processes. Stretch wrapping is a process of unitizing a pallet of goods to reduce the risk of damage before they reach their final delivery destination. We selected the premium stretch films in the market today to deliver the highest in quality standards. We’ve developed performance-driven products that deliver flexibility and reliability to your packaging solution. Partnered with our revolutionary programs, we offer stretch wrap solutions that aim to reduce cost, improve performance and reduce waste. Our Wrap It Right program analyses your stretch wrap usage and finds ways to improve efficiency and reduce waste. Our Packaging Specialist visits your facility for a hands-on review of your stretch wrapping process. Following the review, a comprehensive usage analysis is performed and areas for improvement are identified. Improvements can include using a better film for your application or altering the wrapping cycle for optimized film use. Regular updates are then performed as part of the Keep It Right program to ensure your stretch wrapping process maintains its peak efficiency. Our Crawford Guardian hand film category was developed to offer the best stretch film choices and solutions targeted to our customer’s needs. Developed from the best stretch film technology available, these products are guaranteed to meet or exceed our customers' expectations on each load, every time. Our Crawford Guardian brand films offer solutions for both hand and machine applications. Visit CPsupplyline.com to order Stretch Wrap Film today! Contact Crawford Packaging today for a packaging consultation of your existing stretch wrap materials and processes. Stretch wrap offers a variety of benefits to packagers and shippers. It holds loads together and reduces movement that causes damage, unitizes loads for easy handling and can increase a loads residence to external elements like dirt and rain. Sudden stops, careless material handlers and rocky waves are only some of the dangers faced by your shipments. These hazards cause loads to shift and sway and can sometimes lead to toppling or collapse. Stretch film reduces the risk of damage by holding loads tightly together and locking them to the pallet. With upwards of 2% of all shipped goods becoming damaged during transport stretch wrap film has become one of the leading product protection methods. Load unitization is the process of packaging and transporting smaller cartons that have been grouped and combined into a single unit. Once unitized a load becomes more manageable during handling as cartons are moved as a single unit, not one by one. Stretch film offers packers/shippers cost-efficient method of unitizing loads quickly and easily. A load unitized with stretch film also increases load security and prevents theft. It is virtually impossible to remove a single unit from a wrapped pallet without compromising the wrap and leaving obvious signs of tampering. Available in a variety of colours, stretch wrap film offers warehouse agents an easy and efficient method of distinguishing unitized loads at a glance. A stretch wrapped skid offers added protection through increased stability and security. A properly wrapped skid protects the products inside from exterior elements. Standard clear stretch films offer protection against dirt that may be present when a load is stored in a warehouse or outside storage area. For loads that are sensitive to water, top cover sheeting can be added to the wrapping process to create a fully encased load from top to bottom. UV resistant stretch wrap films are available for loads with light-sensitive products or for loads that may spend extended periods outdoors to prevent discolouration. Stretch wrap or stretch film is a thin plastic film that is applied around a palletized load. 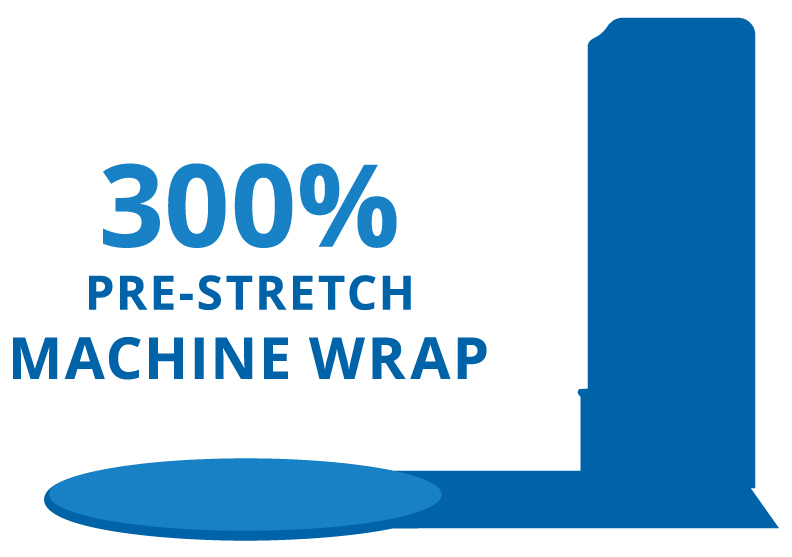 Available in a variety of types for both machine and hand wrapping methods, stretch wrap offers an effective way to combat costly damages that can occur during transport. With upwards of 2% of products being listed as unsaleable, it is clear to see why stretch film has become one of the leading ways of preventing damage during the shipping process. As stretch film is applied, it undergoes a stretching process, pulling it taught and extending its length by upwards of 250%-300%. The strength of the film provides the pallet with increased structure and containment capabilities, while the stretching of the film reduces its ability to loosen when under force. The taught film forms a constrictive force around the load, holding it in place. Stretch film also helps to lock goods to a pallet, with the bottom wraps holding the load in place on the skid. Stretch wrap films are available in a variety of types, materials, colours and gauges. It is a versatile packaging material that offers an optimized film type for virtually any packaging solution. Stretch wrap film can be produced in both blown and cast formats for hand and machine applications. Blown stretch film is produced by blowing heated resins into a bubble. The bubble is then transformed into sheets that a rolled and applied to a core tube. Cast films are manufactured by feeding heated resins through a line of cooled rollers. The rollers cool and solidify the film which is then cored and cut into the proper roll sizes. The two types of stretch wrap that are used for packaging are hand applied stretch wrap and machine applied stretch wrap. Each type of film has been specifically engineered by the manufacturer for its application type. One of the key considerations when considering either a hand or machine applied stretch film is the volume of pallets that are going to be wrapped. If your volume is low, and your pallets are uniform you may find hand wrapping to be a more efficient process. Alternately if you have a high volume of pallets, heavy or awkward pallets or loads that require a stronger containment, a stretch wrapper and machine applied film may be a better fit. When volumes, space or budget restrictions demand that stretch film is applied by hand, our experts get the right solution into your hands. Over the years changes to hand applied stretch film have revolutionized its use. Newly developed hand films offer easier to use, cost-effective alternatives to the classic hand film systems. From pre-stretched hand films to engineered lower gauges, today's solutions are cost-effective and operator focused. This has helped to get the productivity and security your application depends on. Whether you are shipping less than 5 or 10 loads daily or have multiple operators wrapping hundreds of loads, we have the solutions and products that will deliver your goods intact each and every time. High-performance machine stretch films are designed to cover a broad range of machine applications. Our wide range of machine applied stretch films offer solutions for both semi-automatic stretch wrappers and fully automatic inline systems. Our lineup of cast and blown stretch films provide excellent load retention, puncture resistance and greater cost efficiencies compared to other competitive stretch films in the marketplace. We work with your business to develop a packaging platform that provides consistent protection for your products. By matching the right film to the right job, we limit the risk of damages during shipping and ensure every product shipped arrives in as made condition every time.